When your oath is to defend the United States against all enemies foreign and domestic, no duration is defined—and there is no statute of limitations…. Luke Archer is a retired Special Forces Colonel and CIA operator who never expected—or wanted—to go back to those days of living in the shadows and at the tip of the spear. But when he wakes up early one morning to the sound of a helicopter landing in his front yard, those hopes and expectations are forever dashed. Called back to Langley, he’s asked to identify an elusive terrorist leader, known as “The Ghost,” who only he can identify. Reluctantly, Archer agrees to assist, and in the aftermath of that operation, his life is turned upside down.Reuniting with his former team members, he learns that an old teammate has been deliberately poisoned with a rare substance that only sophisticated nation-states possess. Launching his own investigation, Archer suddenly finds himself as the FBI’s Most Wanted Terrorist, fighting an entrenched government network of high-level officials who will stop at nothing to take over the United States from within. In a deadly race against time, through the unseen corridors of power, Archer uncovers dark forces that threaten the security and stability of the nation, leading to a personal revelation that is all but impossible for him to conceive. 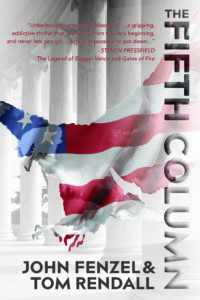 Riveting, explosive, and all-too-evocative of today’s political environment, The Fifth Column is an unforgettable story that has been torn from today’s headlines. John Fenzel (author of The Lazarus Covenant and The Sterling Forest) and Tom Rendall have created a page-turning thriller that provides extraordinary view of our nation’s history, our democracy, and those who have taken an oath to support and defend the Constitution against all enemies, foreign and domestic.